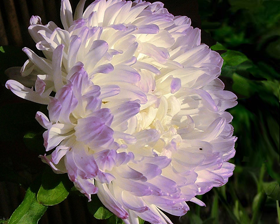 Very attractive, incurved, fully double blooms, in a delicate, soft violet bicolour. The long, strong flower stems tower above bedding, adding height to displays and making an excellent cut flower. Sow March to April. Sow in pots or trays of moist seed compost and cover with a fine sprinkling of compost or vermiculite. Place in a propagator or warm place, and keep at a constant temperature of between 20-25C. Germination will usually take 7-21 days.